I'll go ahead and predict right now that this will be among the least viewed—and least searched for—of my blog posts. But, hey, no one said trumpeting the obscure is about getting attention, right? Along with being the final movie by British director Carol Reed (The Third Man, Our Man in Havana, Oliver! 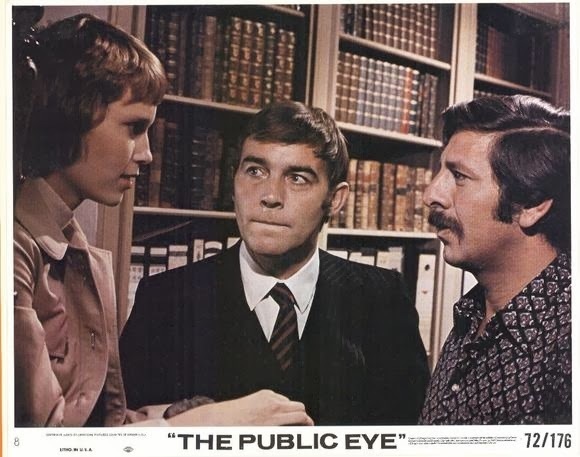 ), The Public Voice was written by playwright Peter Shaffer (future scribe of Equus and Amadeus); stars Mia Farrow—between high-profile roles in Rosemary's Baby (1968) and The Great Gatsby (1974)—and Topol, Oscar-nominated the year before for Fiddler on the Roof; and boasts a score by John Barry, who was already well on his way to legendary composer status by virtue of his James Bond films. In other words, A-level talent across the board. So, what happened? Why has this amusing, and occasionally trenchant, comedy-drama been almost completely forgotten? As you start watching it, possible answers emerge: Miscasting (the three leads seem to have been matched up using a backwards-thrown dart). Overly theatrical dialogue (Shaffer adapted the script from his own play). 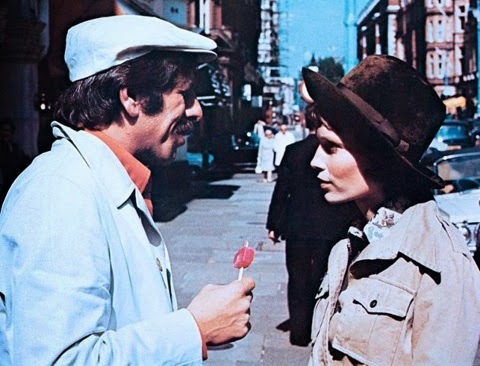 A romantic, classical style in an era of cinematic adventurousness (this was also the year of The Godfather, Cabaret, and Last Tango in Paris). Poor costuming and styling (Mia Farrow often looks stifled in her strange hippie-spinster attire and overly coiffed bangs). 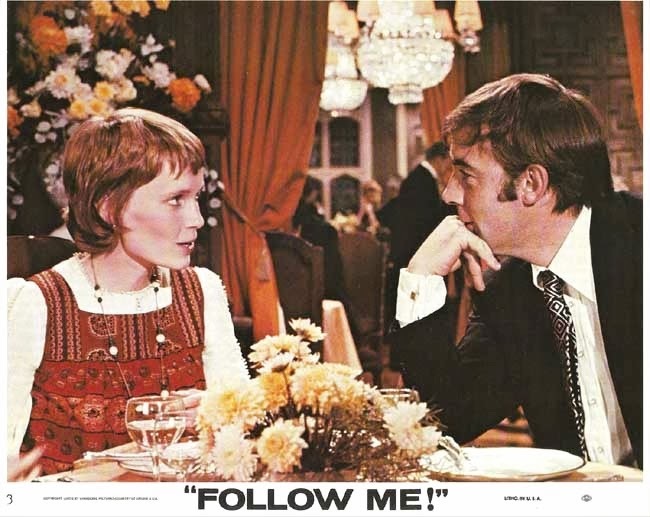 And yet, this story of a stodgy English accountant (Michael Jayston) suspicious of infidelity by his young wife (Farrow) has a surprising ace up its sleeve: the private detective (Topol) hired to follow the wife. It's not clear at first what role this character will play beyond the predictable, but before long his goofy charm and wordplay begin to ingratiate, helping us more easily tolerate Jayston's increasingly unsympathetic Charles and the gloomy oppression of Farrow's Belinda. Topol hijacks every scene he's in, getting in the best lines and giving the entire enterprise a leg up into notable territory. For all the theatricality of Topol's persona—there's a reason he was cast as Tevye in Fiddler on the Roof—he always manages to convey a grounded likability that compensates for any disparity between his outsized line readings and those of his costars. You think, "Yeah, he's going really big with that, but that's just Topol, and he's such a fine fellow, why complain?" And he really is great fun to watch—a kind of wiser, hungrier Inspector Clouseau (he almost never stops eating). And if the path his character takes occasionally teeters into preciousness, he holds your attention not only with his bulk and shtick, but with a twinkling intelligence that has you anticipating the movie's end—when you'll join him at a pub and be regaled by ouzo-drenched tales of seducing women and battling producers in far-flung locales. But something else happens as well. At around the halfway point, Farrow's character lurches into life, dragging her husband with her, and the two must confront not the movie cliche of a soured romance, but one that's grounded in truth—especially the truth of that time and place. That's where the script's origins as a play lend an advantage, as Schaffer (and Reed) allow the characters to engage in the kind of heartfelt, probing discussion that causes many a movie producer to reach for a large red Sharpie. 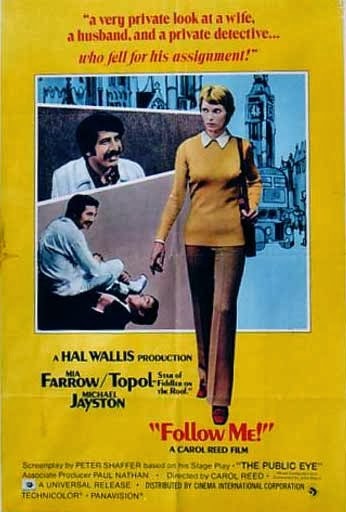 But it's also the point where the picture proves it should be taken seriously, as more than a simple comedy showcasing Topol's charms and the many picture-postcard shots of early-'70s London. What supplants romance in a relationship, it asks, once the courting is over? When are barriers of education and class insurmountable? Is it inevitable that our most generous and receptive qualities go by the wayside once we start taking our partner for granted? (At times the film anticipates some of the movie talks Farrow and Woody Allen would have in future collaborations.) There's wisdom and sincerity in Shaffer's words and in the solution he offers his characters. It's a young writer's solution, certainly—and the skeptics out there may shake their heads—but there's a satisfaction in knowing that this obviously mismatched pair really does want to make things work. Fewer plot contrivances and more compelling chemistry between Farrow and Jayston would have made it go down more easily, but the efforts of Shaffer—and Topol's guileless romantic—go a long way toward making The Public Eye a rewarding watch. Beyond being simply another soon-to-expire Netflix curiosity, it's a love story of its time with more than enough oddness and pedigree to justify its existence. Catch it before it slips away again into movie history's ether. The Public Eye expires from Netflix Instant on 2/1/14.